There are different indicators, and here we have pulled information from expert organizations ([BFF(1&2), [WN16], [MK07], [DJ07], [MK07], [DJ07], [EU15]). We also describe further a few of these indicators so that you can better identify undesirable behaviors. For further articles and guides on the topic, please check our Annotated Resources & References section. Note that ★ below refers to material potentially visually disturbing. Check our Annotated Resources & References section for more information about animal welfare science and other examples of non functional and stress behaviors. This refers to inappropriate levels of locomotion or inactivity (even of apathy). Repeatedly looking towards visitors may indicate that the animal is not comfortable with the situation (care should be taken to define between this and vigilance towards the visitors that may indicate general interest). Hiding, turning back, covering, fleeing… This is about actively avoiding the visitors, and showing a possible need to escape from this stimulus. This refers to being over protective of youngsters, or constantly seeking reassurance from conspecific and can indicate fear. Tension caused by a stressful stimulus can result in increased intra-group aggression, or even aggression directed at humans. Inappropriately high level of scent marking can indicate poor welfare in some species. Acute urination and defecation can happen when suddenly frightened. Increase in scratching in some species (e.g. primates) as well as other less frequent behaviors such as excessive grooming, or self biting would be considered to be negative. When looking at birds such as parrots, pay a special attention to self mutilation and feather picking or plucking behavior (which indicate serious stress issues). Such vocalizations may be emitted if suddenly frightened by the coming and/or the appearance of visitors. Tell us why this enclosure is an illustration of poor welfare conditions. 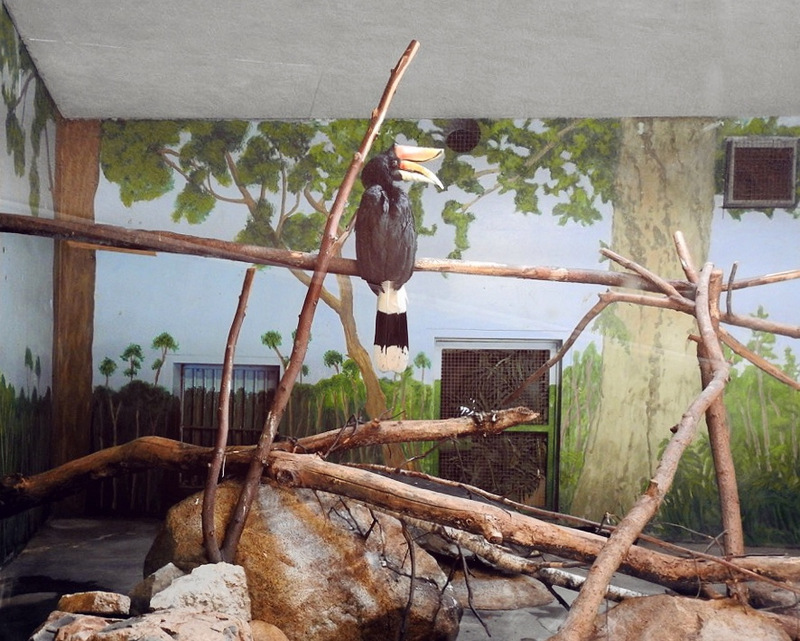 More and more zoos who try improve their animal welfare conditions are adopting a behavior-based type of husbandry, this includes what is known as operant conditioning but relying on positive reinforcement, as well as it accounts for providing richer of enrichment conditions in various categories. Behavior based husbandry tries to incorporate all elements of good animal welfare, good health, psychological well being, and natural behavioral expression (therefore closer to a realization of the 5 freedoms). Behavior-based husbandry considers not just elements, such as enclosure design or enrichment, but also human animal relationships, the animal’s choices with regards to its environment, mating opportunities or social interactions, and a level of control over its environment and its daily routines. We focus here on enrichment types that are required for providing a minimum welfare quality and that are also easier to identify or to ask questions about during a visit. Check the enclosure for the presence of physical enrichment that helps promote natural behaviors. This may include bedding material, branch work, burrows, nesting boxes, pools, substrates, and appropriate vegetation. By ‘appropriate’ we mean that they should be as close as possible to the animal natural habitat’s substrate. Check the enclosure for the presence of occupational enrichment objects. These are natural or non-natural objects that can be manipulated, such as toys, traffic cones, or other items that are usable (and safe) for the animal. Ask about the type of feeding enrichment that the facility is providing to the animal, this is the provision of food related activities, novel food items and devices, or the scattering of food. If you are looking at a carnivorous predator, ask how they provide for an alternative of the natural predatory behavior. For instance, a cheetah chases to catch its prey, and it is important that they exercise their chasing skills. Check the type of food they provide to an animal, Is it an adequate diet? What type of meat they give their big cats? For instance feeding chickens to tigers on a regular basis (as has happened too many times in some shady sanctuaries/zoos) is detrimental to the health of the animals. Etc. Check and/or ask how sensory enrichment is provided. This refers to the provision of novel or familiar scents, sounds, visual, or tactile stimuli, but done in a way that is not stressing the animal(s). Check and/or ask how cognitive enrichment is provided to the animal. Cognitive enrichment can be items that present mental challenges, and engage the animal in problem-solving often for a reward. Check for evidence of social enrichment of the animal. This refers to the provision of intra or interspecies social stimuli, training and positive human-animal relationships. Although it should be clear that intra-species relationship when it is a characteristic of the species can never properly be replaced with a human-animal relationship, and therefore should not be encouraged as an alternative to a natural relationship. Observe your visitor colleagues and the zoo staff who is here to help with proper rules of conduct, and assess their impact. Potentially uninformed visitors can contribute greatly to increased levels of stress (Freedom #4) as well as may prevent the animal to express a natural behavior (Freedom #5). How many visitors are allowed per enclosure? How is the maximum number being enforced? What are the implications of too many visitors? Too many of us correlates with discomfort and stress, therefore impacting negatively the Freedoms #3 and #5. What are the minimum visitor-to-enclosure and visitor-to-animal distances? Is the enclosure glass or bars at visitor arms distance? (Note that there are countless reports of visitors banging on the glass or the bar enclosure which distress the animals). What are the implication of suboptimal distance between us and the animal? : Potential violation of Freedom #2, #4 and #5. Human visitors being too close triggers for many animals activity change, heightened vigilance, aggressive behavior increase. How loud are the visitors? (laughing loudly, talking loudly, screaming in excitement). And how does the zoo staff regulate the noise level. Implications? Human noise disturbance has been proven to be a welfare issue, potentially resulting in the violation of the Freedoms #2, #3, #4 and #5. Tip: Download the Noise Tube App and during your visit turn your mobile phone into an environmental sensor and participate in the monitoring of noise pollution in captive animals environments. Not tied directly to the 5 freedoms but an important set of questions nonetheless –with effect on understanding the animal welfare conditions– relates to the educational impact of the zoo. How are the visitors educated about the animals? Are they reading the signs? Do they engage with the staff? Is there actually a zoo staff in the vicinity who can readily talk about the species behavior in the wild, about its conservation status and can provide details about how the species is protected in its natural habitat? In other words is the staff and volunteers’ knowledgeable about their animal guests so that they can increase substantially the awareness and knowledge of the visitors, therefore contributing to fulfilling the zoo educational mandate? How approachable and open is the staff regarding questions about the welfare of the animals (and the 5 freedoms specifically)? Note that answering the questions of visitors in a respectful and informative manner is required by the AZA regulations [KR15].